Insecticon Bombshell is a master of mind control. 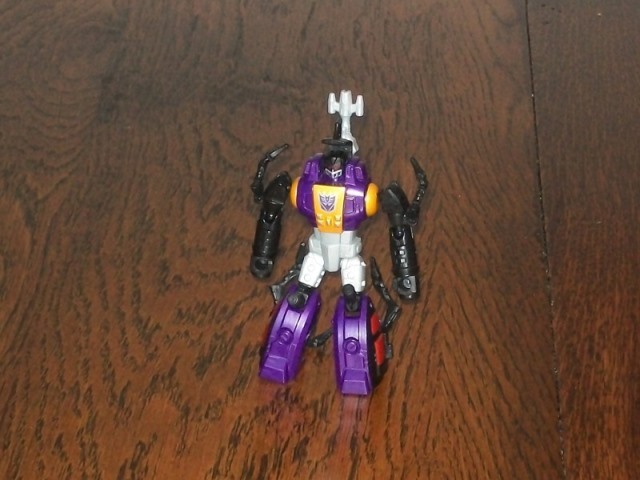 The Insecticons have always been popular characters with sharp colour schemes unique character designs and memorable portrayals in the 80s cartoon. But due to a scattergun approach to character selection and a tendency to play it safe with alt-modes, the bugs had a hard time breaking into the Generations line and its predecessors. Kickback made the group's first appearance in 2012, but as a Fall of Cybertron figure he served more as an interesting novelty than a true update of the original character. It was only with the advent of the Legends price point and the smaller, less-expensive figures that it entails that Hasbro has started making a concerted effort to revisit the smaller characters from the 80s. That effort resulted in a new Shrapnel in 2014, and at the start of 2015 it brought us Bombshell as well! 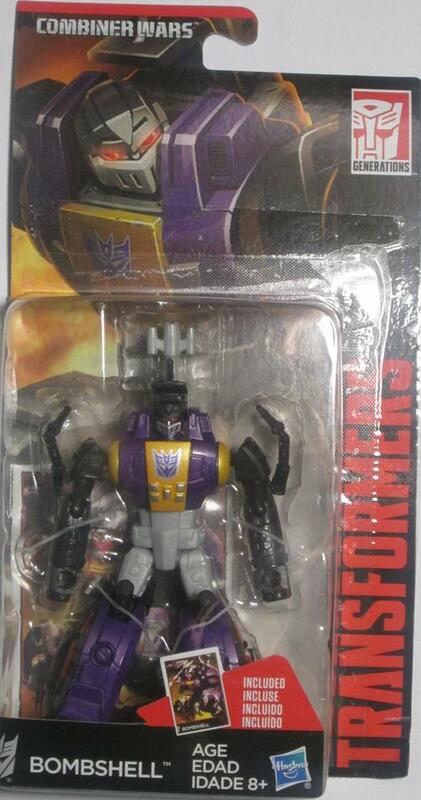 I've always been a fan of the Insecticons, though I was a hair too young to own any of them as a child. Their mechanized bug alt-modes and eye-catching purple, black and orange colour schemes have always been tantalizing, though, and the modern interpretations of those classy oh-so-80s designs have so far turned out very well. Out of the three, Bombshell is definitely the closest to the source material when it comes to design, colours and even transformation steps. But does that make him a good toy? Robot Mode: Bombshell comes packed as a robot, and he definitely caught my eye compared to all the other Legends on the shelf. His colours are nice, his robot mode is well-proportioned and mostly free of kibble, and he's got more paint apps than we've come to expect from this size class. Even if I hadn't been actively looking for him, I think I probably would have grabbed one based on the good first impression he makes. The new packaging helps a lot in that regard too, as it is very, very eye-catching from afar. Bombshell's legs and much of his chest are molded in a nice, deep purple. His crotch, head-mounted mortar and thighs are molded grey, while his arms, head and knee-cannons are black. Orange-gold paint apps adorn his shoulders and breastplate, and are joined by silver details on his abdomen and a tampographed Decepticon symbol. The paint apps on his face are quite nice too, with small beady red eyes and a finely-detailed grille faceplate. The sides of his legs are painted black with red details on top, and he has red paint apps on the soles of his feet too. The end result is a little guy who just pops with colour and makes most of his fellow Legends look a bit on the cheap side. In particular, compared to last year's Shrapnel he looks far and away superior in just about every way. As a sleek, streamlined take on the 80s figure, it would be hard to do better. When it comes to poseability, Bombshell outdoes many of his peers yet again. With double-jointed shoulders, ball-jointed elbows and hips, thigh swivels, hinged knees and a waist joint, he can strike up almost any pose you can think of. His big feet and low weight give him great balance. Unfortunately, he suffers from the same issue as the Swerve mold: a head with no side-to-side motion. I can understand why Hasbro didn't bother -- between his head-mounted mortar and the towers on his shoulders, a head joint probably wouldn't have much more than a 30� range of motion. It still would have been nice to have the joint, though, and like Swerve before him he's cheapened a bit by its absence. Bombshell's leg articulation is also hampered a bit by his insect legs. Although they fold up neatly into his shins, fold them in too tightly and they'll make it difficult to pose his knees. On the other hand, if you don't fold them tightly enough they'll take up a lot of space and ruin his sleek kibble-free look. It's a bit of a balancing act, make tougher by the fact that the legs are individually poseable, but the joints are so tight that they both tend to move even when you're only trying to move one of them. Bombshell eschews the tiny Targetmaster partner that previous Legends came with, something that I can only consider addition by subtraction since the partners were uniformly awful (although unlike many of the previous Legends he does have form for coming with a tiny partner, as his Actionmaster incarnation was packed with the truly awful, lime-green Needler). Unfortunately, that means he doesn't have any accessories at all. He seems to be a bit more complex than Shrapnel or his ilk and definitely has more and better paint apps, so at least some of the partner's budget seems to have been redistributed to the main figure. Still, it's always a bit of a shame when a good figure doesn't even come with a little gun to point at his enemies. Overall, Bombshell's robot mode works very nicely. The figure is a step up from most of the previous Legends, and it captures the character quite well. Alternate Mode: The beast mode is a more radical departure from the original Bombshell than the robot mode was. G1 Bombshell was essentially a box with wheels and a mortar bolted on, easily the least insect-like of the original Insecticons. Generations Bombshell is a long ways from that. Though still clearly mechanical, the new design is far more rounded and natural looking. 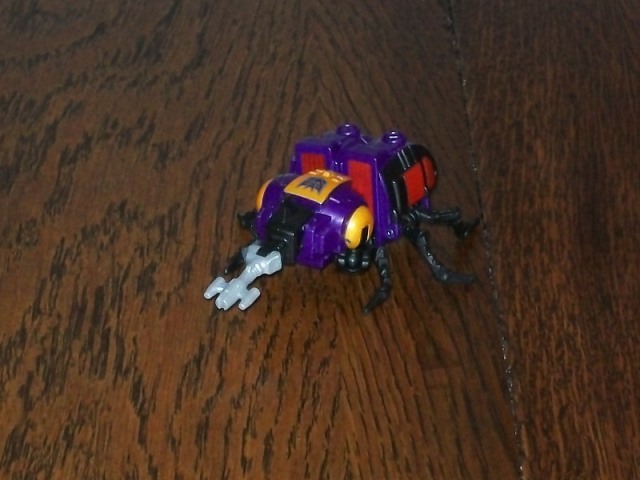 The addition of actual insect legs in the place of wheeled rollers adds a lot to the mode as well. Bombshell is mostly purple now, with a black undercarriage and nose and a grey rhinoceros beetle horn. Most of the robot's paint apps are still visible in this mode as well. Bombshell is quite compact in beast mode, with all of the mass of his robot limbs collapsing into a tightly-packed insect body. That should be no surprise to anyone familiar with the original, though, because it collapses in exactly the same way. As a bug, Bombshell has seven points of articulation -- one for each of his bug legs, plus his horn. I wouldn't go so far as to call him "poseable" though, since all seven appendages are tiny compared to his main body. Youngsters would probably have a lot of fun swooping him around and having him shoot Autobots with his cannons, though, since he's basically palm-sized. He doesn't really do anything on his own, but at this size he really doesn't need to.